Santa Claus is real, so that’s not up for debate. But because he is kind of devoted to email these days instead of old-fashioned letter writing, the United States Postal Service has decided to help out to make sure your kid can send a letter to Santa and get a personal snailmail response from the North Pole. In the time leading up to Christmas, the USPS is offering a program where children can write a letter to Santa and include all the wooden trains, yo-yos and whatever other toys kids like these days, then send it off like a normal letter. 2. Insert the letter into an envelope and address it to the child. 3. 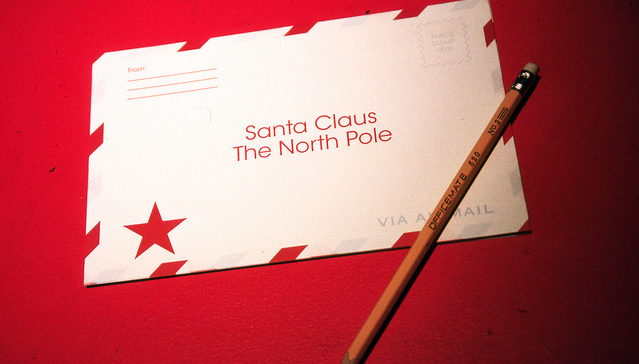 Add the return address: “SANTA, NORTH POLE” to the envelope. 4. Ensure a First-Class stamp is affixed to the envelope. 6. Santa’s helpers in Anchorage, AK, will take care of the rest! If you want your letter to get to Santa on time, it’s got to be mailed to Anchorage no later than Dec. 10. Plenty of time to put together a list of checkers, spinning tops and a new pair of fuzzy red socks. Is The Origin Story For NORAD’s Santa Tracker A Cold War Lie?